Elected on a campaign of ‘free market’ economics and ‘limited government’ catch phrases, Scott Walker has gone to truly remarkable extremes to prove his loyalty to Tea Party ideology. He showed his true colors by proudly sporting an American Flag shirt imported from China in this year’s Independence Day parade in Menomonee Falls. Thus Scott Walker can be fashionably patriotic when it SUITS him, while undercutting wages, benefits and jobs in Wisconsin by importing the illusion of nationalism. I tried to give him the benefit of the doubt, thinking maybe it was an isolated incident. But sure enough, July 4th 2009, he was seen wearing an American Flag shirt at a parade in Menomonee Falls and two others in 2012. If he undercuts wages in Wisconsin enough, maybe we can have sweatshops here in Wisconsin. 250,000 jobs here we come! After World War I, The American Legion developed a National Flag Code as a guide to the display and use of The American Flag. It was adopted as Federal Law during World War II. US Code Title 4, Chapter 1, Section 8(d) Respect for The Flag states “The flag should never be used as wearing apparel.” It was pretty presumptuous of FDR to endorse liberal extremist policies like adopting veterans guidelines for regulating flag use! Instead of honoring our veterans by respecting the flag, Scott Walker chooses to show his disdain for government by honoring the Tea Party mantra of ‘limited government’. How much longer will Wisconsin suffer from a false patriot’s Tea Party devotion? Note: A call to theflagshirt.com confirmed that these shirts are made in China. Not that I don’t believe Walker is a complete tool but what proof is there that Walker’s shirt was foreign made? The company that sells these shirts confirmed that they’re made in China. He’s not wearing the U.S. Flag, he is wearing a shirt depicting the likeness of the flag. The only provision that comes close to it is that it is wrong to print the likeness of the flag on anything of temporary use that is to be discarded, such as napkins. There also is another provision that comes close, but it once again covers the flag itself or a potion of it used as a costume or as clothing, not the likeness of the flag. As far as clothing is concerned, a great many veterans wear the likeness of the flag on their clothing, are they wrong? How dare someone show their patriotism on the forth of July, that is completely unAmerican. 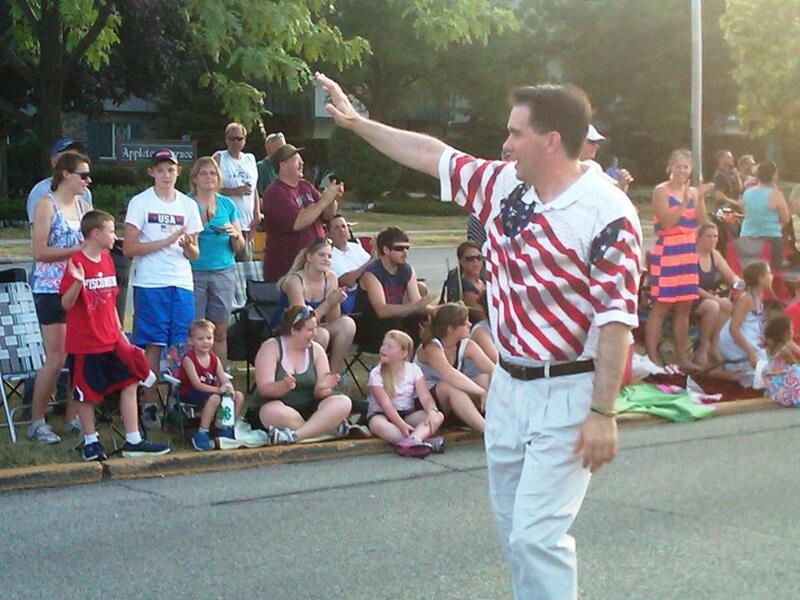 But, if the worst you can manage to say about Scott Walker is that he was caught in public on our nations birthday wearing a pattriotic shirt, well, then you must be desperate.